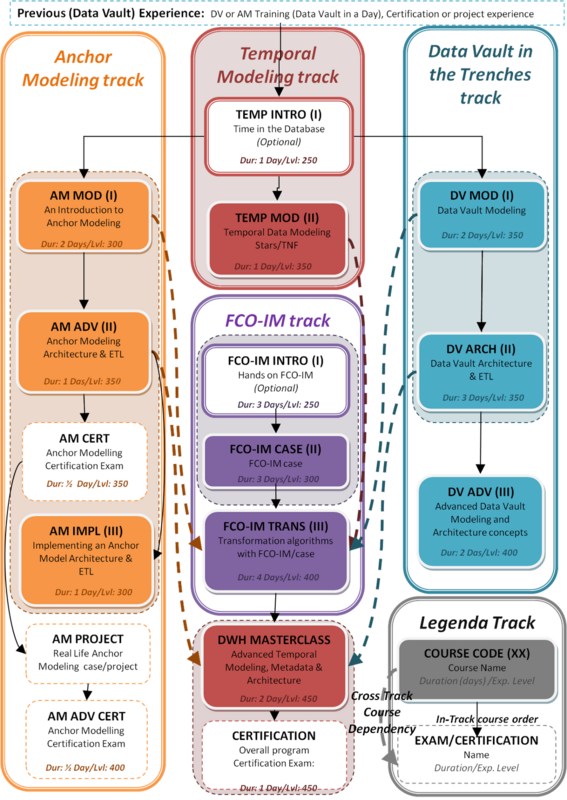 In this blog post I'll show the most recent version of our detailed track and course overview. Note that this is still a concept and is subject to change (although I hope not significantly). I will not discuss the contents of individual courses or tracks in this post, but instead focus on the overall structure of the program. "Broad where we must, Deep where we can"
The program's track design reflects one of the basic principles of our program: " Broad where we must, Deep where we can". Because of this we decided to have a 3 layered approach in our program. Layer 1 is broad and teaches basic and advanced methodology/technology tracks for Data Vault, Anchor Modeling and Temporal Data modeling. 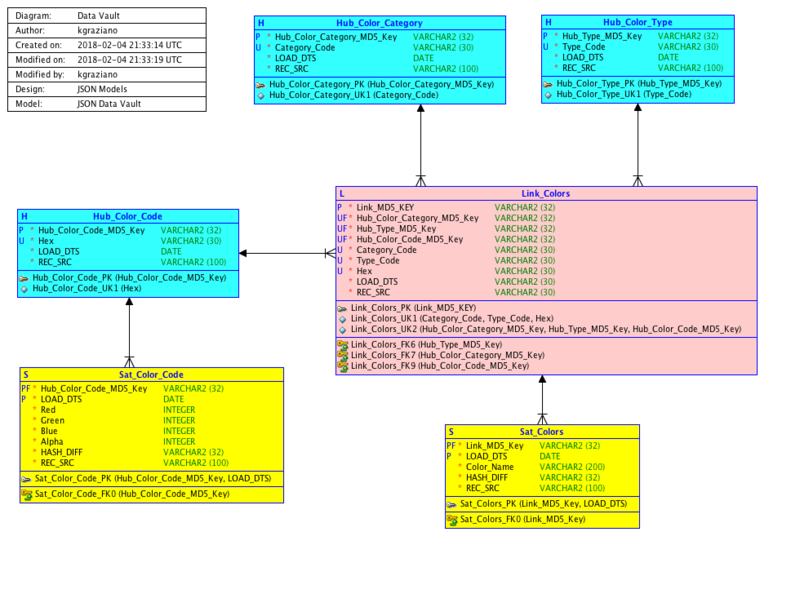 The Architectural and ETL track have been integrated with the Data Vault track because there is a lot of overlap there. We don't assume all students want to follow all the layer 1 courses when doing the program, and some students might only want to follow some of the courses in this layer without following the rest of the program. This layer is probably the most dynamic one as well. We want to offer possibilities to extend knowledge without trying to teach everything. Expect more (optional) courses in the next iteration of the program (basic Data Vault, Dimensional Modeling, Agile etc.) with also additional partnerships. In the 2nd layer we go deeper and try to connect knowledge from layer 1. We will still focus on specific methodology and architecture discussions. The main track here is on Information Modeling. Also the Architecture course is formally in this layer. The Master Class is where things come together and we tie all kinds of knowledge from the different tracks into a more consistent whole. We will discuss mechanics of creating modeling approaches by understanding modeling techniques and their place within (DWH) Architectures. We will also focus on the relation between architecture, methodology and modeling. The following table shows all courses of the MATTER program, their intended level, prerequisites and number of days. Fact oriented + Temp. DWH Arch. 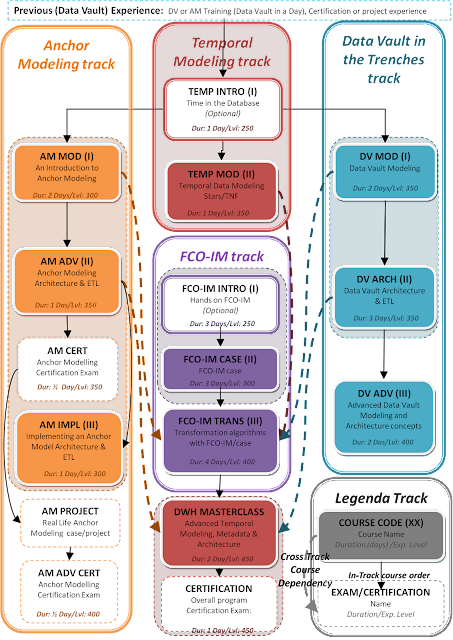 The following diagram shows the detailed dependencies between the tracks and their courses. 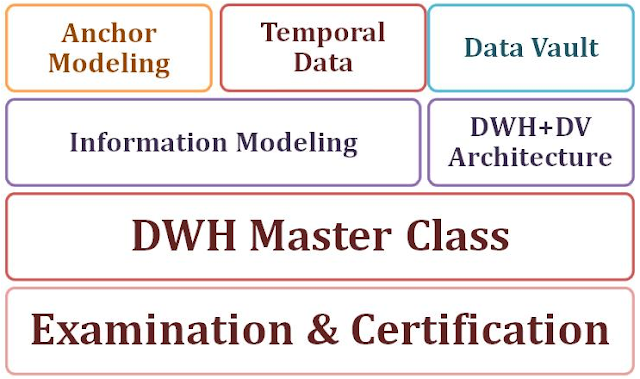 For example, we assume students following the FCO-IM transformation course understand two out of three data modeling techniques from our program (Anchor Modeling, Data Vault or generic Temporal Data Modeling). 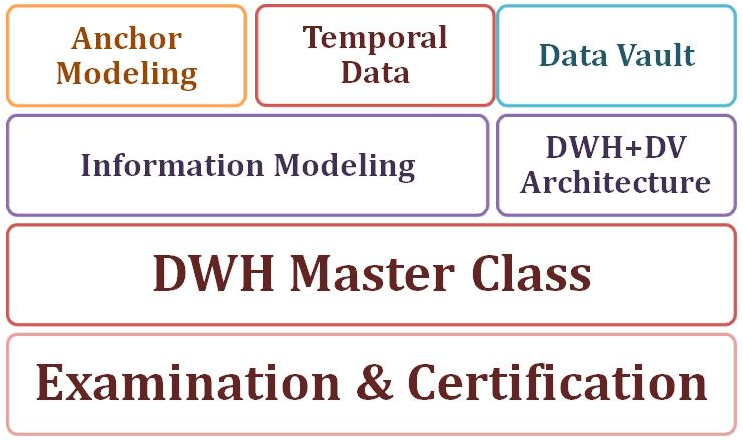 As you can see from the dependency arrows we combine knowledge gained from information modeling track and architecture courses in our masterclass on modeling and automation to understand advanced architectural concepts which should underpin our data warehouse designs. We also have a detailed subject matter matrix per course to give an indication on what type of subjects will be taught in each course. We'll do a LOT of (different styles/techniques/approaches) modeling within the courses of the program. We'll discuss the important concepts around metadata modeling and usage. We put current and future (Data warehouse/ETL) architecture and their construction in perspective. All time related subjects like timelines and their implementations. Here we will focus on implementation details on e.g. SQL or ETL tools.